Christmas is Coming, Guess Who’s Feeling Warm Inside! Christmas Pudding is a big deal in Great Britain, even for the British Royal Household. 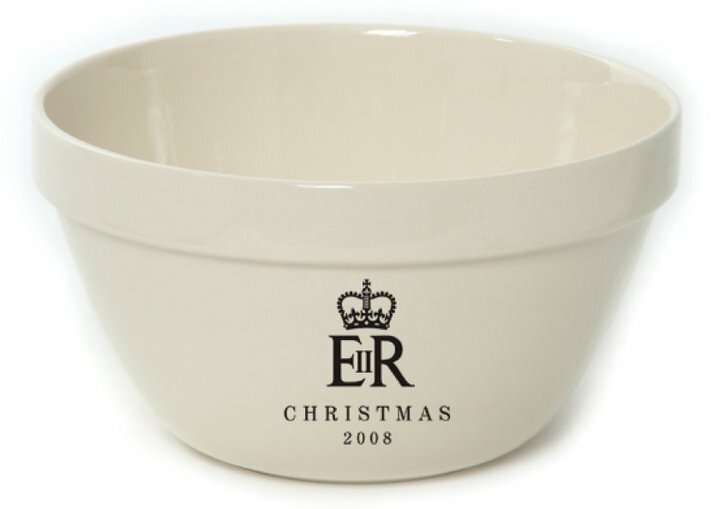 For the past several years, Queen Elizabeth II has gifted hundreds of her loyal subjects, family and friends with Christmas Puddings prepared and presented in none other than Mason Cash pudding basins! We are proud to offer a brief and fascinating history of Christmas Pudding in the English tradition, and a tremendously long and deliciously overwrought recipe for same. Family recipes for Christmas Pudding are often closely guarded secrets, handed down from generation to generation. Many are based on the Royal family’s Sandringham recipe – rich with dried fruit and spices, some include nuts, grated apple or carrot – harking back to years when sugar was scarce. The first Sunday in December is ‘Stir-up’ Sunday, the day when the best puddings are begun. It’s already time to roll up your sleeves and think about making the Christmas pudding. Some cooks go so far as to prepare it six months to a year in advance. In the old days, it was traditional for everyone in the house to come into the kitchen and give the batter a stir while making a wish. The puddings are cooked, cooled and tucked away in a dry place to wait for their final steaming on Christmas Day when they will be turned out onto a handsome dish, decorated with a sprig of holly and wreathed in blue flames from a generous dousing of warmed spirit. It seems as if all of Fortnum and Mason’s stock goes into the recipe: currants, raisins, sultanas, almonds, candied fruit, ginger…. There may also be cherries and citron, or one of the two, or neither, depending on the recipe. Some chefs add to the mixture a diced russet apple and a grated carrot. At the end of Christmas Day, after having listened to the Queen’s Christmas Message, the plum pudding is brought out to be enjoyed for tea on the stroke of five, as one raises a drop of port to toast the Queen! All guests receive a slice with a little dancing flame so that they can make a wish before it goes out. 6. Cover with a fresh cloth and parchment; replace the cover or wrap in aluminum foil and let ripen in a cool spot (not refrigerated) for at least one month. It will be even better if it ages longer! 8. Flambé with brandy or cognac and serve hot with brandy butter. Posted in General, Mason Cash, Recipes | Comments Off on Christmas is Coming, Guess Who’s Feeling Warm Inside! Thanksgiving is the Super bowl of holidays for cooks everywhere. There is so much planning, shopping, recipe testing, and decorating all for that one meal. Before we even begin to cook the “big meal” we have the pre game show – appetizers and cocktails to keep everyone happy while you cook a giant bird that ends up tasting well… like turkey. Don’t let my football talk fool you into to thinking I know anything about the game. I’m just barely aware that football is on television during Thanksgiving and that it has something to do with the teams that play at the Rose Bowl on New Year’s Day, right? It’s too early in the month to start talking about my lack of enthusiasm for cooking turkeys on Thanksgiving, so for now let’s just talk cranberries. Thanksgiving can be a bit overwhelming even for seasoned chefs, maybe that’s why Americans have resorted to opening a can when it comes to the cranberries. It’s almost become a tradition to have a bowl of jiggly wiggly cranberry sauce on the table with the ring indentation still intact. I have to admit, I love the stuff. Give me a roll with a slab of butter and a nice glob of cranberries and I’ll call it Thanksgiving. 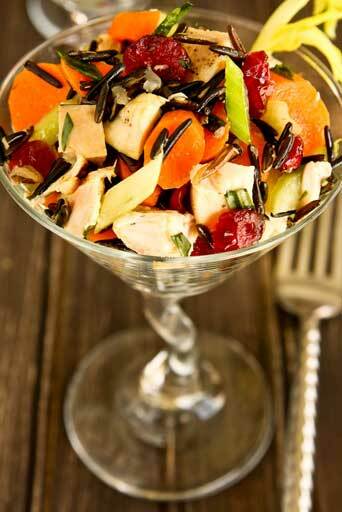 This is a great fall salad that is made with cranberries and tossed in cranberry vinaigrette. It sounds odd with the rice and raw vegetables, believe me I know, but it’s incredibly flavorful and full of texture with a unique sweet and savory flavor balance. Because it’s made without lettuce and served cold or at room temperature, it is a perfect “do-ahead” salad for your holiday table. 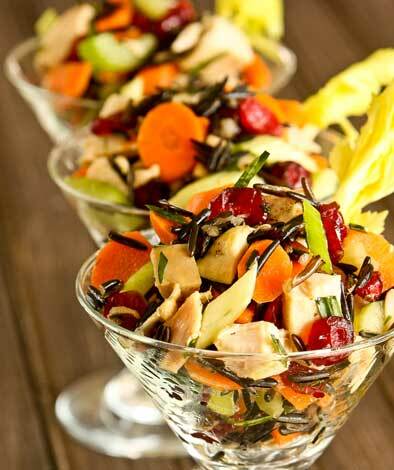 Try serving salad in a Mason Cash pudding basin or a beautiful acacia wood salad bowl – remember presentation is everything, your guests will be so impressed – it will be a sure touchdown. Serve this with a butternut squash soup for a complete lunch or dinner. How will you serve your cranberries this Thanksgiving season? • In a large sauce pot bring the rice to a rolling boil with the salt- cook for about 45 minutes or until rice splits. • Remove from the heat and pour into a strainer- allow to cool. • In a large Mason Cash mixing bowl, combine cooled rice, chicken, carrots, celery, onions, tarragon, and cranberries. Toss with cranberry vinaigrette a little at a time to coat evenly – to taste.